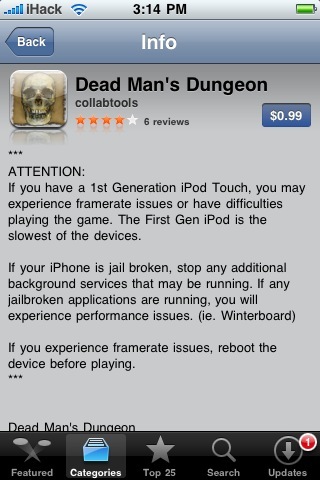 One of our readers sent us this screenshot of an app called Dead Man’s Dungeon. You’ll notice in the description a warning about performance issues if you’re on a jailbroken iPhone suggesting WinterBoard as the problem. It’s interesting that Apple even allows them to use such terminology. Thanks to Frederick for sending this in! That warning isn’t from Apple though correct? Isn’t this from the developer? i had gotten tap tap cold play from installous and when i opened it up yesterday it said that it was a pirated app and if i continue with what i am doing it will eventually catch up with me, they also said that with the ipod touch your exact location can be found, that’s nothing new to me because i have used the location function a lot of times. but it was pretty scary so i deleted all my pirated apps and stopped getting them for good. Same:(, what is this all about? Should i keep the apps or get rid of them?